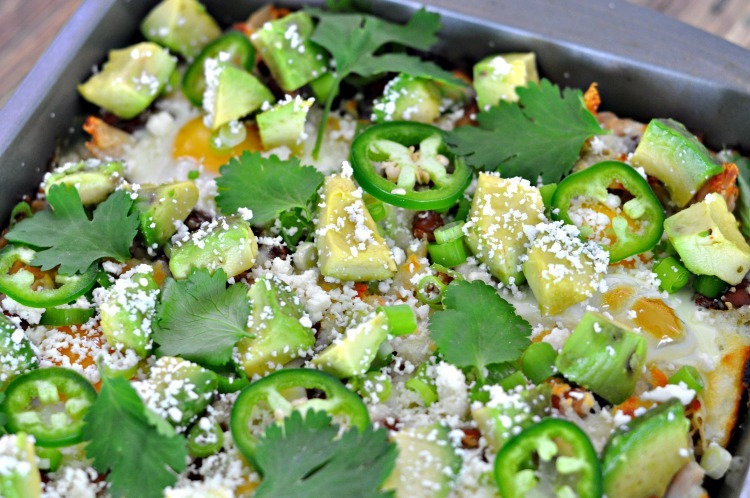 Thank you to Handsome Brook Farms for sponsoring this Chicken Verde Chilaquiles Breakfast Casserole recipe. All opinions are my own. They say breakfast is the most important meal of the day. It sure is for my snowboarding family during the winter! It’s a balance to get a hearty meal that’s also quick and easy to prepare into their bellies each morning. Something quick that’s not hearty, or something hearty that’s not quick, can throw off the whole day. We do a lot of make ahead breafasts like egg cups, overnight oats and baked oatmeal muffins. But sometimes it’s nice to have a hot breakfast straight from the oven – especially during the winter. So I have started making Chilaquiles more often. 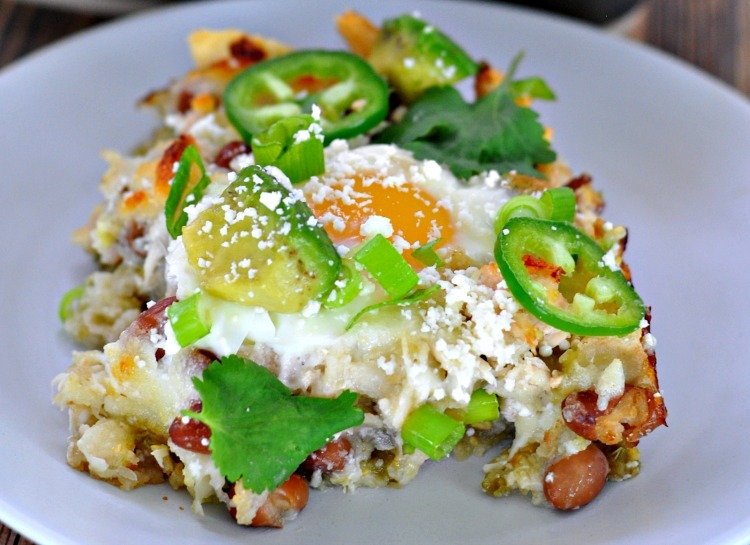 If you haven’t had Chilaquiles before, it’s almost like a nacho casserole topped with eggs. I love adding eggs to breakfast because it’s an easy protein with beneficial vitamins and nutrients to help you start the day off right. Not all eggs are created equal though. Most members of my family get stomach aches from conventional eggs, so we’re careful about what we buy. We recently discovered Handsome Brook Farm Eggs. All of their eggs are both pasture-raised and organic. Unlike many brands that are organic, but not pasture raised, Handsome Brook Farm feeds their chickens an all-natural diet combined with giving them the freedom to forage outdoors. So chickens get to eat all of the bugs and grubs they love so much. This natural diet is what gives Handsome Brook Farm eggs a nice, deep golden-orange yolk and rich, delicious flavor. In addition, pasture raised eggs are more nutritious too. Pasture raised eggs, like Handsome Brook Farm Eggs, can contain twice as many Omega 3s, 38% more vitamin A and 23% more vitamin E than conventionally raised eggs. If you’re looking for nutrient dense food, pastured eggs make a really great choice. Be careful with egg labels though – they can be confusing! You want to look for certified pasture raised eggs like Handsome Brook Farm. This certification lets you know that the hens are raised on grassy pastures with plenty of room to roam free, forage and enjoy the sunshine-filled fresh air. I love how Handsome Brook Farm works with their own revolutionary network of small family farms with smaller flocks. This helps them ensure farmers receive a fair wage and their hens have the space, attention and love they need to produce the best quality eggs. Since discovering Handsome Brook Farms, we’ve been making eggs more. 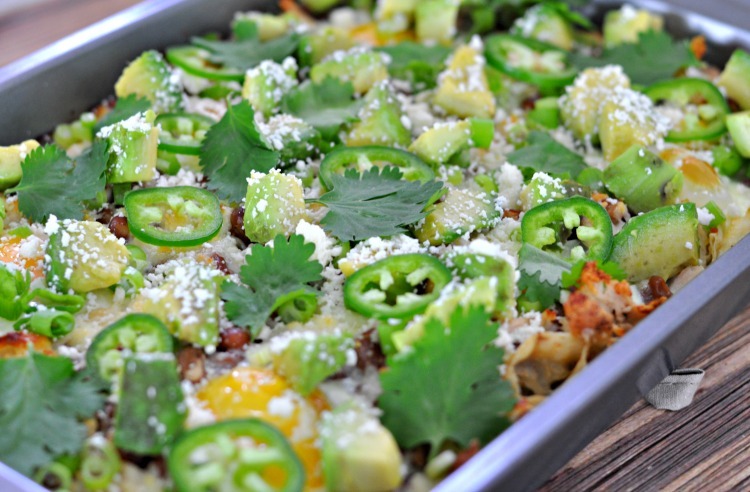 This week we made this delicious Chicken Verde Chilaquiles Breakfast Casserole. 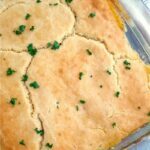 It’s super easy to toss the ingredients together real quick and pop the casserole in the oven. Then you can get ready while it bakes and you’ll have a hot breakfast for the whole family. There are lots of swaps you can make too. You can swap the shredded chicken for chorizo, shredded beef or carnitas. You can swap the queso fresco for more Cotija or even mozzarella. You can change out the toppings. It’s really easy to customize to your tastes! The one thing you don’t want to leave out is the eggs – they’re key! If you want to work more eggs into your family’s breakfast menu, check out Handsome Brook Farm Eggs. They are available nationally at select retailers. Locally, we can find them at Sprouts. 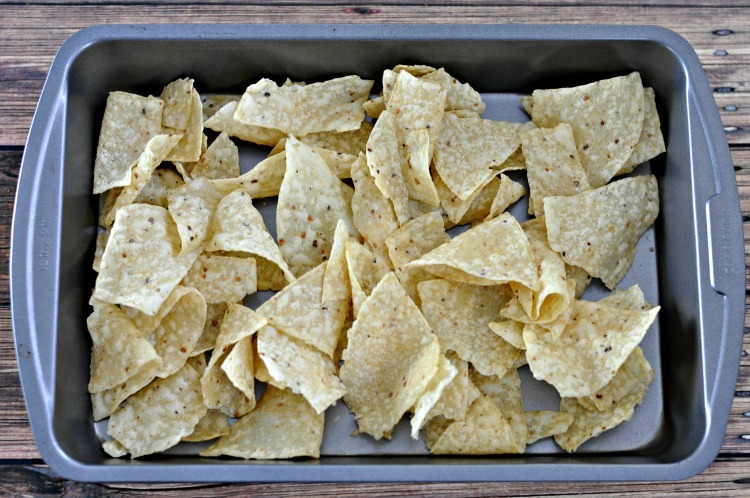 Pour your tortilla chips into a medium sized baking dish. Next, pour the salsa verde all over the top of the chips. Sprinkle ¾ cup queso fresco cheese, the shredded chicken and pinto beans on top of the chips and salsa. Make 6 grooves around the pan and crack an egg into each of the grooves (you could do 8 eggs if you’re serving a larger group). Place your uncovered pan into the oven and bake for about 25 minutes, or until the egg whites are cooked through. Once it’s cooked through and the eggs are cooked to your liking, remove the baking pan from your oven. Top the chilaquiles with avocado, cilantro, green onions, jalapeno slices, Cotija cheese and sour cream. Enjoy a delicious breakfast or brunch with your family! 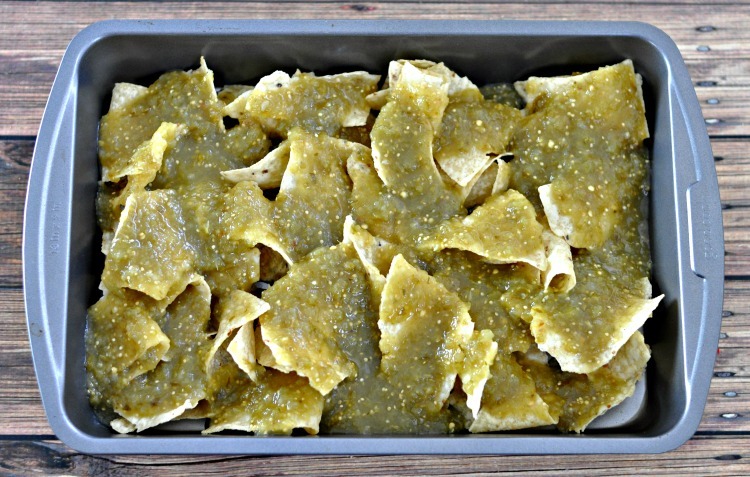 Pour your tortilla chips into a medium sized baking dish then pour the salsa verde all over the top of the chips. 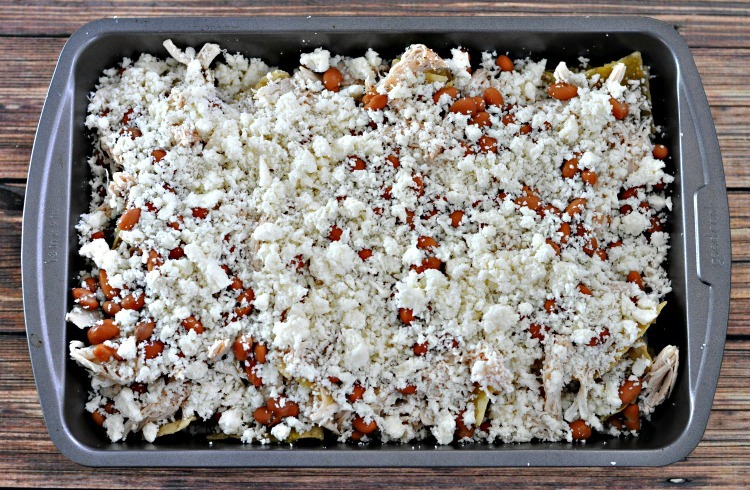 Sprinkle ¾ cup queso fresco cheese, the shredded chicken and pinto beans on top. Make 6 grooves around the pan and crack an egg into each of the grooves. Place in oven (uncovered) and bake for about 25 minutes, or until the egg whites are cooked. 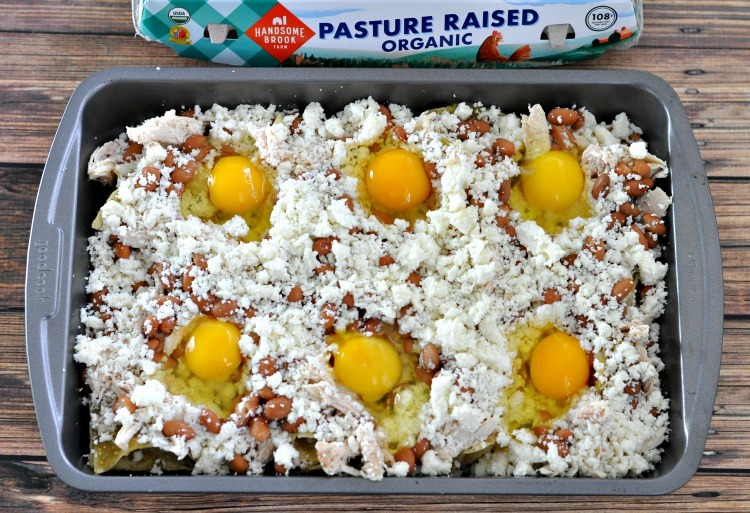 Let us know how your family likes this Chicken Verde Chilaquiles Breakfast Casserole! 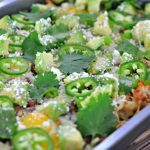 Pin this Chicken Verde Chilaquiles Breakfast Casserole Recipe to Your Breakfast or Casserole Board! This looks so good – a perfect Sunday morning breakfast at our house – Thanks for sharing at the What’s for Dinner party! Oh my goodness! This looks amazing and I kind of want it right now! Pinned it for later. Thanks so much for sharing and linking up with me On the Edge. I can’t wait to try this recipe! I love Mexican food so I’m always looking for new recipes. I love how the eggs are on top and not poured over where it would make the tortilla chips soggy. Plus all that salsa verde is perfect!